Lizards running on hind legs? 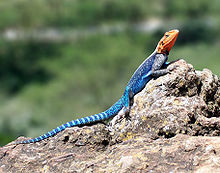 Lizards that are placed in the Agamidae family include: Agamas, dragons, tree lizards, sailfin lizards, and other agamids. 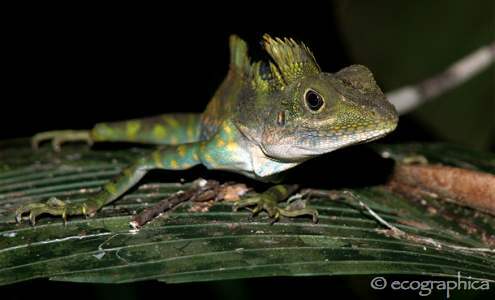 According to “Animal world”, there are more than 300 species of Agamid lizards in Africa, Asia, Australia, and a few in Southern Europe. They are able to change their colours, in order to regulate heat. On top of that, they have strong hind legs that allow them to run two-legged when threatened. I first came across a video clip on the Australian Frilled lizard (frilled dragon), running away from threat, and was amazed at how lizards could actually run on their hind legs. It seems like a comedy. 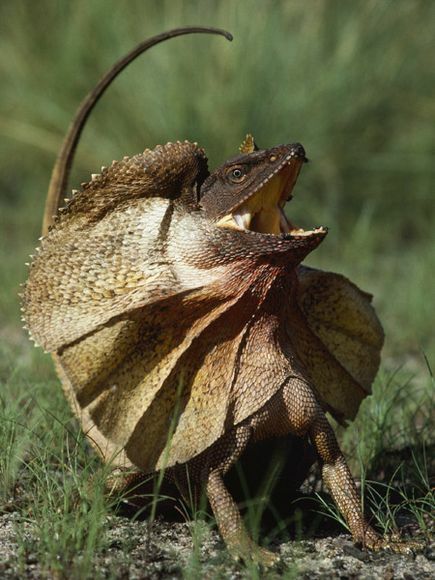 When threatened, the Australian frilled lizard raise its hind legs up to run away from the threat. At the same time, it opens its yellow-coloured mouth which eventually encircles its head, and hisses. 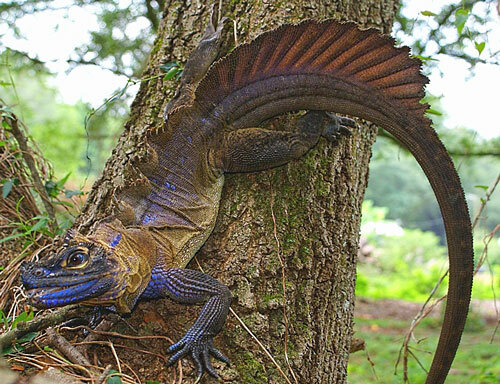 From the National Geographic article on “Frilled Lizard Chlamydosaurus Kingii”, it was stated that if the attacker were not to be threatened by its act, it would turn its tail, mouth and frill open, and begin running with its hind legs without stoppiong or looking back, till it reaches safety. 3) when least threatened, frontal orientation, short rushes toward the intruder with mouth open, bitting attempted. From this, we can see that these lizards when threatened with fear of a different extent, behaves slightly differently. And when they are really afraid…. they even run in a “no turning back” manner with their hind legs. 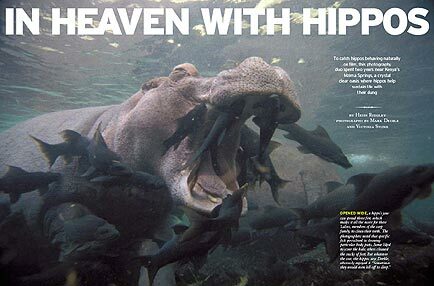 While symbiotic relationships between hippos and fish have long been documented, Deeble and Stone (2001) made a bonus discovery when they started taking photographs beneath the surface of Kenya’s Mzima Springs for the first time. They found that different species of fishes are highly specialized in cleaning specific body parts of the hippopotamus. The genus Labeo, under the family of carps, is the main cleaner, using its large mouth to scour the hippo’s hide, teeth and palate. Barbel fish (Barbus) gets the “dirtier” job of cleaning the hippo’s feet—the cracks in its soles and gaps between the toes—as well as its hind. The smaller Cichla fish feeds among the tail bristles while tiny Garra tends to the master’s wounds. But the hippopotamus does prove itself to be a thoughtful master after all. As observed from the video, it would proactively move to spots where the fishes are more densely populated, and would also open its mouth and spread its legs so as to facilitate the whole cleaning process. Little aggression is observed and the hippo seems tolerant of the large number of fishes nibbling off its body. As gross as it may sound, these fishes actually get a lot of nourishment from feeding on the hippo’s dung and on the waste from its skin. It is no wonder that fishes aren’t the only animals willing to serve this great king. Studies have shown that many birds have also been observed to help groom the hippo by feeding on insects and parasites from its back. The more commonly observed bird species include the Common Sandpiper (Tringa hypoleucos), African Pied Wagtail (Motacilla aguimp), Red-billed Oxpecker (Buphagus erythrorhynchus) and Yellow-billed Oxpecker (Buphagus africanus) (Olivier and Laurie, 1974). The high incidence of open wounds on hippos’ backs, a result of high levels of intraspecific aggression, provide a rich food source for these birds, but it is indeed interesting how hippos are aggressive to its own kind, yet a gentle giant to others! You would have probably noticed the Capuchin monkeys on the big screen, starring in popular sequel movies such the Night at the Museum (as Dexter and Able) and Pirates of the Caribbean (as Jack). The Capuchin monkeys who starred in popular movies. However beyond the Capuchins’ fame in Hollywood movies, scientists are discovering the Capuchins’ intelligence both in laboratory settings and also in the wild. Capuchins are regarded as the “brainiest monkeys”, because they not only have the largest brain-to-body ratio of any nonhuman primate (Fragaszy, Visalberghi, & Fedigan, 2004), but they are also have a stunning ability to use tools and learn how to use “token exchange”. Cooperation and sense a fairness are the fascinating themes of the video. Vulcan and Virgil, a pair of tufted Capuchin monkeys (Cebus apella) cooperated by solving the flint and hazelnut problem. Virgil gave Vulcan a fair share of the hazelnuts, showing their cooperation and a sense of fairness. Without further ado, the video would show you their fascinating behaviour! Capuchin monkeys are able to learn “token exchange”, where a token could be associated and exchanged for rewards or tools (Westergaard, Evans, & Howell, 2007). However, when Vulcan realised that Virgil received a grape instead of a biscuit, he refused to accept the biscuit anymore. This not only showed the food preference for the grape, but also the “inequity aversion” behaviour of Vulcan when he pushed away the biscuit and kept trying for a grape instead. On the other hand, a study found that the inequity aversion could instead be due to a “frustration effect” induced by changing the Capuchins from their role as “models receiving a high-value food” to the role of witnesses “receiving a low-value food” (Silberberg et al., 2009). The study also considered that the correlate between inequity and frustration is not as strong because the frustration of nonhuman primates is variable. Nevertheless, the cooperation and sense of fairness, a “point of principle” as narrated by Sir David Attenborough, are indeed captivating abilities that the Capuchin monkeys have. A short blog also commented and provide further insights on the video (The Subjective Lens, 2010). Beyond the laboratory settings, there are also remarkable discoveries in the wild. The hyperlinks to the videos are provided below! 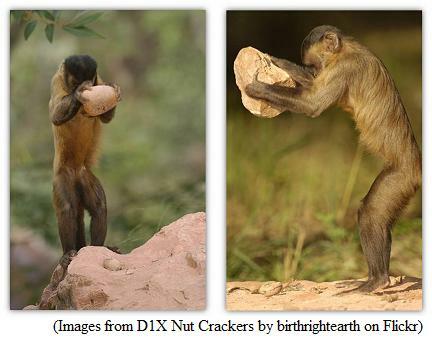 In the wild - the Capuchin using a hammer and anvil to crack open nuts. “A sense of fair play,” by The Subjective Lens. The Subjective Lens… adventures of a cowboyastronomer, 5 Sep 2009. URL: http://subjectivelens.com/blog/?cat=24 (accessed on 5 Apr 2010). “Crystal the Capuchin Monkey”, by PETSblogs.com. PETSblogs.com. URL: http://petsblogs.com/2009/12/crystal-the-capuchin-monkey/ (accessed on 5 Apr 2010). Silberberg, A., Crescimbene, L., Addessi, E., Anderson, J. R., & Visalberghi, E. (2009). Does inequity aversion depend on a frustration effect? A test with capuchin monkeys (Cebus apella). Animal Cognition, 12, 505-509. Takimoto, A., Kuroshima, H., & Fujita, K. (2010). Capuchin monkeys (Cebus apella) are sensitive to others’ reward: an experimental analysis of food-choice for conspecifics. Animal Cognition, 13, 249-261. Westergaard, G. C., Evans, T. A., & Howell, S. (2007). Token mediated tool exchange between tufted capuchin monkeys (Cebus apella). Animal Cognition, 10, 407-414. “Monkey Cooperation and Fairness (excerpt from the Monkey Puzzle),” by tehinfidel. URL: http://www.youtube.com/watch?v=aAFQ5kUHPkY (accessed on 5 Apr 2010). “BBC Two Programmes, Wildlife on Two, Capuchins: The Monkey Puzzle”, narrated by David Attenborough. URL: http://v.youku.com/v_show/id_XMjE5MjQ1MzY=.html (accessed on 5 Apr 2010). “Monkey’s bluff – Clever Monkeys – BBC Earth,” by BBC Earth YouTube Channel, 18 May 2009. URL: http://www.youtube.com/watch?v=8c7NEf6qFlc&feature=PlayList&p=0CFFD978C8FF3D27&playnext_from=PL&index=2 (accessed 5 Apr 2010). “Monkeys on the lookout – Clever Monkeys – BBC Earth,” by BBC Earth YouTube Channel, 20 Jul 2009. URL: http://www.youtube.com/watch?v=jxT8YS4VpGk&feature=PlayList&p=0CFFD978C8FF3D27&playnext_from=PL&index=4(accessed 5 Apr 2010). “Nutters – the monkey production line – Clever Monkeys – BBC Earth,” by BBC Earth YouTube Channel, 20 Jul 2009. URL: http://www.youtube.com/watch?v=fFWTXU2jE14&feature=PlayList&p=0CFFD978C8FF3D27&playnext_from=PL&index=5(accessed 5 Apr 2010). 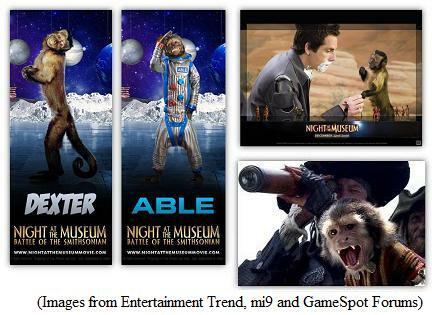 “Larry Daley (Ben Stiller) and the little monkey in movie Night at the Museum wallpaper,” by mi9.com. mi9.com. URL: http://mi9.com/c20p1g1573f1i21549/larry-daley-ben-stiller-and-the-little-monkey-in-movie-night-at-the-museum/ (accessed on 5 Apr 2010). “Monkey Trouble,” by Sentinelrv. GameSpot Forums – The HeadCrab Union Board – Monkey Trouble. URL: http://www.gamespot.com/pages/unions/forums/show_msgs.php?topic_id=25728886&union_id=55 (accessed on 5 Apr 2010). “Night At The Museum 2: Battle Of The Smithsonian Wallpapers,” by www.nightatthemuseummovie.com. Entertainment Trend. URL: http://www.entertainmenttrend.com/night-at-the-museum-2-battle-of-the-smithsonian-movie-review/ (accessed on 5 Apr 2010). The popular cartoon series, Tom and Jerry, depicts hilarious fights between two arch enemies, a cat and a mouse. Sharing predator and prey relationship, this bubbly pair is always seen plotting against each other with uses of explosives and nonsensical traps. One can say that these two, are much too close for comfort. 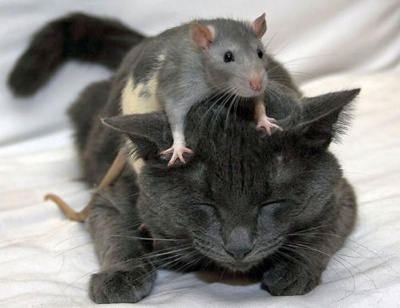 However, in reality, this pair – mouse (Mus musculus) and cat (Felis catus) – may actually be as close. Research has found that by making genetic changes in mice’s sense of smell, we can remove its fear of its predator, the cat. As a result, mice can scatter around a cat freely, without any sense of fear. This research highlights that mice’s fear towards cats is both instinctive and learnt. Hence, if genetic changes in mice’s smell of smell could remove its aversion towards cats, it implies that alteration to mice’s instinctive behaviour overrides any other learnt behaviour to escape from its predator. Alternatively, other sources indicate that parasites could cause a similar behaviour alteration in mice. Toxoplasma gondii, a parasite that is found to attach to mice, can alter its hosts’ behaviour by making them more active and even a preference for cat odors! Rodents act as intermediate host reservoir for the parasite while its definitive host is actually the Felis. In order for the sexual reproduction and maturation of the parasites to be completed, the parasite must be eaten by a predatory definitive host. Thus, in manipulating its intermediate host’s, the mice, behaviour, the transmission from intermediate host to definitive host is enhanced, thus increasing the parasite’s chances of reaching maturation and engaging in sexual reproduction. While rodents may seem to have a fatal attraction towards their predator, it is unsure if this love will be returned on the side of the felines. Nevertheless, let’s hope that they will have a blissful marriage, till death do they part.